A prayer carried in your pocket. A place-keeper in your book. A reminder of your favorite prayer. A comforting Bible verse. Holy cards are instructional, informational, and inspirational. 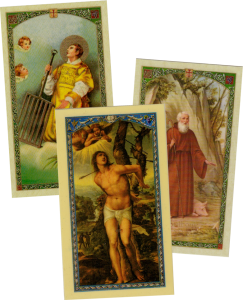 This pack of 20 laminated holy cards features some of the most popular figures who lived during the time of Christ or within the next few centuries. Saints included in this pack: Martin de Tours, Sebastian, Peter, Mark, Luke, Martha, Lazarus, Lawrence, Monica, Mary Magdalene, Anthony Abbot, Agnes, Augustine, Anne, Barnabas, Benedict, Leo the Great, Andrew, Blase, and Bartholomew. 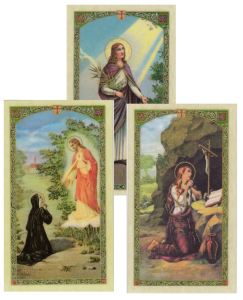 Find familiar and more obscure female Saint holy cards in this pack of twenty. Features the following Saints: Agatha, Margaret Mary, Mary Magdalene, Martha, Maria Goretti, Madeleine Sophie Barat, Rebecca, Teresa of Avila (two different cards), Judith, Adelaide, Anne (two different cards), Agnes, Lucy, Kateri, Rita, Barbara, Monica and Rose of Lima.